Hurricane season begins tomorrow and it is expected to be busy. Tropical cyclones, known as hurricanes in the United States, develop around the globe at different times of the year. In this country, we are most affected by the Atlantic hurricane season, which runs from June 1 through November 30. Peak activity, however, is usually from August to October when sea-surface temperatures are warmer. Last year was an extremely active season with nineteen named storms – the third consecutive year with that number. Four of these made landfall in the US: Beryl, Debby, Isaac, and Sandy. This year, NOAA is predicting another above average season. Some of the main climate factors of this energetic forecast include warmer than average Atlantic ocean temperatures – which fuel hurricanes – and a currently neutral El Nino-Southern Oscillation pattern in the Pacific. When the El Nino aspect of this oceanic-atmospheric phenomenon is present, it produces upper level winds that can limit the development of Atlantic cyclones. The neutral phase of this pattern, however, allows for a more favorable environment for storms to develop. Barreling through the Oklahoma City area on Monday afternoon, a powerful tornado leveled the suburb of Moore, OK. It claimed the lives of twenty-four people and injured hundreds of others. The National Weather Service has rated this deadly twister as an EF-5. That is the highest ranking on the Enhanced Fujita Scale. On the ground for forty minutes, with winds in excess of 200 mph, this powerful storm cut a path of destruction seventeen miles long and more than a mile wide. Located in the heart of tornado alley, this community is no stranger to severe weather events. Moore was in the path of the infamous tornado of May 3, 1999 that set the record for the fastest wind speed ever recorded, 318 mph. As it has in the past, this town is planning to rebuild. The price of which, according to current insurance estimates, is expected to exceed two billion dollars. 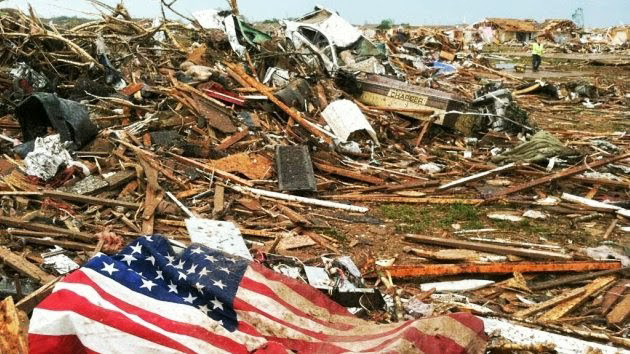 A field of debris from Monday’s EF-5 Tornado in Moore, OK.
Floods are often thought of as disasters, especially when people and property are harmed. In nature, however, some ecosystems thrive on periodic flooding. While traveling in South Carolina last week, I had the opportunity to visit one such place – Congaree National Park. 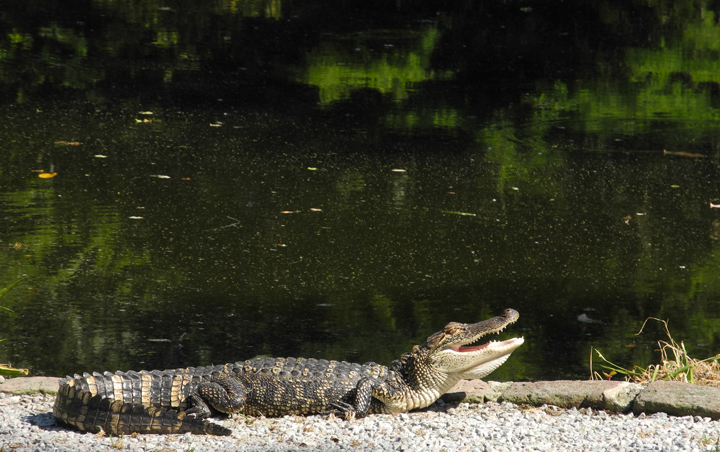 Situated in the floodplain of the meandering Congaree and Wateree Rivers, the park protects the largest expanse of old growth bottomland hardwood trees still standing in the southeastern United States. It is home to a dazzling array of biodiversity, including a number of champion trees – tress that hold the size record for their species. These include a bald cypress with a circumference of twenty-seven feet and a loblolly pine standing one hundred seventy feet tall. These trees would not be able to flourish without the moisture and nutrient–laden sediments that flood waters bring to the forest floor. This floodplain forest is typically inundated by water several times a year. During my visit, the park was about 90% flooded as a result of recent heavy rainfall on top of an already wet spring. It was an impressive sight. 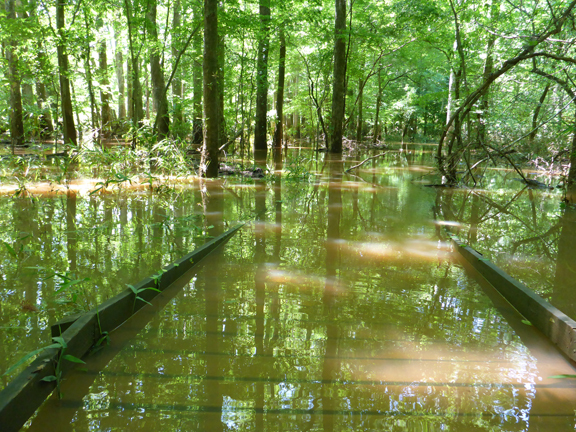 The elevated boardwalk trail in Congaree NP disappears into high flood waters. 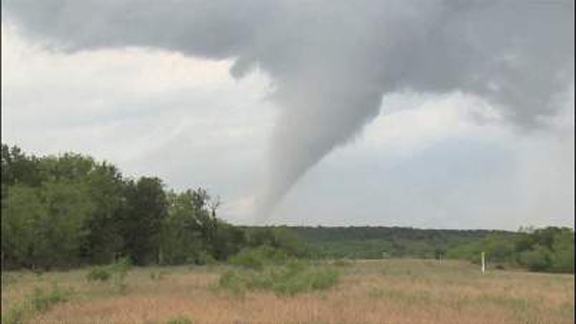 A swarm of tornadoes barreled across northeastern Texas on Wednesday evening. These powerful storms caused widespread damage and claimed the lives of at least six people. The National Weather Service, in its preliminary assessment, reported that sixteen twisters touched down near the Dallas-Fort Worth Metroplex, one of the largest metropolitan areas in this country. The strongest storm in this outbreak was rated an EF-4, the second highest ranking on Enhanced Fujita Scale. With winds ranging from 166 to 200 mph, it devastated the town of Granbury, TX. Another hard hit area was Cleburne, TX, where an EF-3 storm is reported to have cut a path one-mile wide through part of the city. Tornadoes, nature’s most violent storms, are generated by severe thunderstorm activity. That said, not all thunderstorms produce twisters. They need something to set the lower atmosphere into a twisting motion. In this case, that was warm, humid air moving north from the Gulf of Mexico that collided with hot, dry air blowing in from the west. Torrential downpours drenched New York City yesterday. In fact, the Big Apple received nearly a month’s worth of rain in just one day. According to the National Weather Service, 3.02 inches of rain fell in Central Park. Not only is that a new daily record, it is more than double the amount of rainfall the city received during the entire month of April. After a stretch of twenty-five days with hardly any significant precipitation, yesterday’s rain was very beneficial for the area. The rate at which it came down, however, caused a number of localized flooding problems. April’s famous showers were few and far between in New York City this year. We only collected 1.31 inches of rain, which is 3.19 inches below normal. This makes April 2013 the city’s fourth driest April on record. Bouncing up and down throughout the month, temperatures in the city felt like they were on a roller-coaster. One day even brought the Big Apple a taste of summer with a high reading of 82°F. 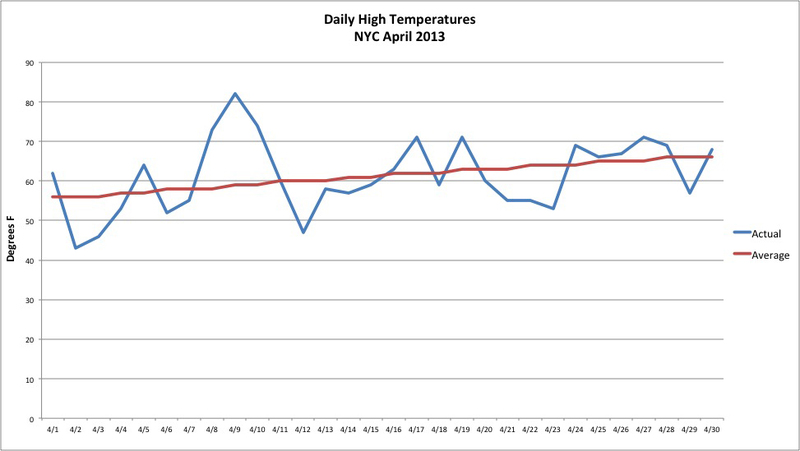 Despite these extremes, the city finished the month with an average temperature of 53°F. That is neither warmer nor colder than normal.